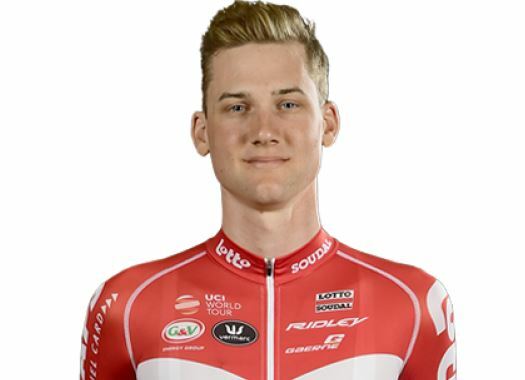 Tim Wellens (Lotto-FixAll) has taken the victory at the fourth stage of the Giro d'Italia. The Belgian was the fastest at the uphill finish in Caltagirone. The fourth stage of the Corsa Rosa consisted of a rolling 160-kilometre long course between Catania and Caltagirone in Sicily. On the first day in Italy, Jacopo Mosca (Wilier Triestina), Quentin Jauregui (AG2R-La Mondiale), Marco Frapporti (Androni-Sidermec), Enrico Barbin (Bardiani-CSF) and Maxim Belkov (Katusha-Alpecin), formed the escape of the day and created a gap of more than three minutes with the peloton. Back in the pack, BMC took charge of controlling the speed in an effort for Rohan Dennis to keep the Pink Jersey. At around 30 kilometres from the end, the front group started losing members due to the climbs until only Belkov, Frapporti and Mosca remained. Behind them, UAE Team Emirates took control of pulling the peloton to catch the escapees, while riders like Sergio Henao (Sky), Gianluca Brambilla (Trek-Segafredo) and Jose Goncalves (Katusha-Alpecin) suffered mechanical problems or punctures. At around 14 kilometres to go, the breakaway was over and the peloton rode together to face the last climbs of the day. The first attack on the penultimate climb came from Edoardo Zardini (Wilier Tristina) and Valerio Conti (UAE Team Emirates) followed. A couple of kilometres later, Conti dropped his companion while back in the pack teams like Bahrain-Merida, Sunweb and Lotto-FixAll set the rhythm. With around three kilometres remaining, Conti was caught. At the last kilometre, Esteban Chaves, Simon Yates (Mitchelton-Scott) and Tim Wellens (Lotto-FixAll) got a small lead but were soon caught by a reduced group. In the last meters, LottoNL-Jumbo's Enrico Battaglin accelerated but was swiftly caught and surpassed by Wellens, who ended up taking the victory of the stage. Michael Woods (EF Education First) was second and Battaglin was third. This is the second stage victory for Wellens in the Italian grand tour. Dennis kept the Pink Jersey for another day.